Voltage-Gated Ca2+ (Cav) Channel 연구에 많이 사용되는 best seller top 10가지 제품을 소개합니다. Left: I-V relation before (squares) and during (circles), bath perfusion of 5 μM (±)-Bay K8644 (#B-350). Right: An example of current response to 200 ms depolarization to +20mV (from holding potential of -100 mV) before (black) and during (pink) perfusion of (±)-Bay K8644. Representative whole cell recordings of evoked neurotransmission in cultures treated with vehicle or GV-58 (#G-140). Adapted from Beske, P.H. et al. (2017) Sci. rep. 7, 15862. with permission of SPRINGER NATURE. Calyxes were whole-cell voltage-clamped at -80 mV. Traces were recorded in the presence of 1 mM CaCl2, pharmacological isolation of VGCC subtypes was performed in 2 mM CaCl2. 200 nM ω-Agatoxin IVA (#STA-500) was applied to selectively block CaV2.1. Adapted from Lubbert, M. et al. (2017) eLife 6, e28412. with permission of eLife Sciences. Cells were loaded with fura 2 and incubated without (control) or with 500 nM ω-Conotoxin MVIIC (#C-150). 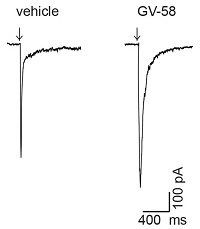 Intracellular Ca2+ was measured at 15 sec intervals before and after addition of nicotine. 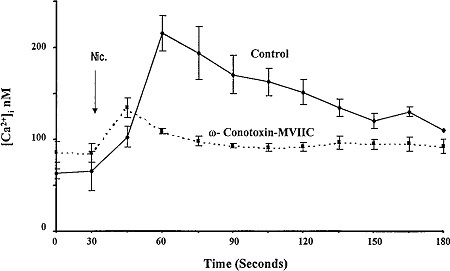 ω-Conotoxin MVIIC reduced [Ca2+]i in response to nicotine by 65%. Adapted from Gueorguiev, V.D. et al. (1999) Am. J. Physiol. 276, C54. with permission of the American Physiological Society. Representative CaV currents from INS-1 832/13 cells before and after treatment with Nifedipine (#N-120), a general L-type CaV channel blocker and SNX-482 (#RTS-500), a CaV2.3 channel blocker. 52% of the currents were blocked by Nifedipine (n = 8; p < 0.05) while 31% (n = 10; p < 0.001) of currents were blocked by SNX-482. Cells were held at −70 mV for 2 min after formation of whole-cell mode, and currents elicited by stepped 300 or 500 milliseconds depolarizations in 10 mV increments. Adapted from Xie, L. et al. (2016) PLoS ONE 11, e0147862. with permission of PLoS. Representative example of sensory nerve response (impulses (imp)/s) to hypoxia in the presence of vehicle or 25 μM TTA-A2 (#T-140), and 5 min after washout (left panel). Effect of TTA-A2 on sensory nerve response to hypoxia (right panel). Adapted from Makarenko, V.V. et al. (2015) Am. J. Physiol. 308, C146. with permission of the American Physiological Society.